Think of lawn bowls, and you will probably imagine elderly men and women in white, competing in sombre silence. But in Australia the game is being taken over by the young and the hip - who want to have fun and walk barefoot on the grass. They are tanned, they are twenty-something and they are drinking beer, with the vast South Pacific Ocean stretching off into the distance. This is the scene at Clovelly Bowling Club in Sydney, one of 2,000 bowling clubs in the country where the game is undergoing a youthful transformation. There are no dress codes, no rigid regulations and no shoes - think swimming trunks rather than starched whites. Barefoot bowls, as players lovingly call the new game, has been growing for more than a decade, possibly driven by two Australian pop culture phenomena - a low-budget comedy film called Crackerjack released in 2002, and a Melbourne-based TV show called the Secret Life of Us which aired from 2001 - 2005. Both featured young people playing lawn bowls, albeit somewhat ironically, and that - says Tony Sherwill of Bowls Australia - started changing the image of the sport. "For a lot of people the stereotype was that bowls was played by retirees and it was stiff, but those two shows busted the stereotypes that people had," he says. Mick Malloy who wrote, produced and starred as the title character Jack in Crackerjack, says he's glad the film seems to have had this unintended effect. "Even though there's a bowls club in pretty much every town I think young people kind of just walked past them and felt it was 'secret old people's business'," he says. "Hopefully the film showed that bowls clubs by and large are very welcoming, and fun places to be - a game of bowls is basically a front for a social occasion. And, as Jack says [in the film], the drinks are at 1970s prices. That probably helped. "The new clientele has helped breathe new life into a sport that was in decline. Bruce Hockey, 61, a competitive bowler at the Clovelly Bowling club, says it was close to closing a few years ago, but the influx of new players turned things around. "At one stage it was going pretty bad, but the new bare footers, that's why the club is doing so well. We get 200 bare footers every weekend and it's really big money." These casual players generally don't become registered members of the clubs they frequent, opting to pay by the hour to play instead. They also spend a lot more at the bar than the older generation. "It's more about socialising with your mates It's like a daytime alternative to going out and drinking at a bar," says Justine Anderson, 31. "I know I don't take it seriously. I play it like I am playing 10-pin bowling." The barefooters' casual weekend games would scarcely have been imaginable to the British settlers who brought the game to Australia in the 19th Century, founding a club in Melbourne as far back as 1865. "When the game started expanding rapidly through the 1950 and 1960s the rules seemed to get more rigid during that period," he says. Bowls enjoyed wide popularity in Australia for the next four decades, with the number of registered players peaking at around 50,000 in the early 1990s, making it the country's fourth biggest participant sport. 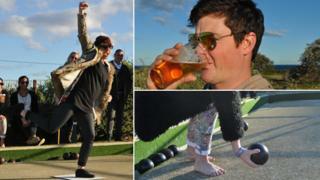 Typically Australians who had enjoyed higher impact sports in their youth settled in to bowls as they aged, Ward says. "Fourteen percent of the population in 1950 played tennis so if you say those people were about 30 in 1950, by 1990 they were about 70 and they weren't playing tennis any more, they were playing bowls. "It had huge numbers, but that crusty rigid image wasn't attracting new players and the numbers dropped away steadily." The barefooters arrived in the nick of time. Over at Paddington Bowls club, in Sydney's Eastern Suburbs, where the club motto is "bowls without the olds" they cater almost exclusively to younger crowds, generally aged between 20 and 40. Patrick Henningham, a "bowls butler" at the club describes his job as a mix between a bartender and an instructor. "The older generation, there are probably one of those for every 20 of the younger punters so yeah, I think it would be dead in the water without the new generation coming through," he says. Are the younger players are ruining it for the older ones? The general consensus is that without the money casual players are putting into the local clubs, they might go out of existence. "It would be a huge loss. There's so much history in these places, and they embody an aspect of our culture that we're in danger of losing forever. "The country is changing rapidly, and for the better mostly, but it's nice to know that these islands of traditional Australian values still exist."